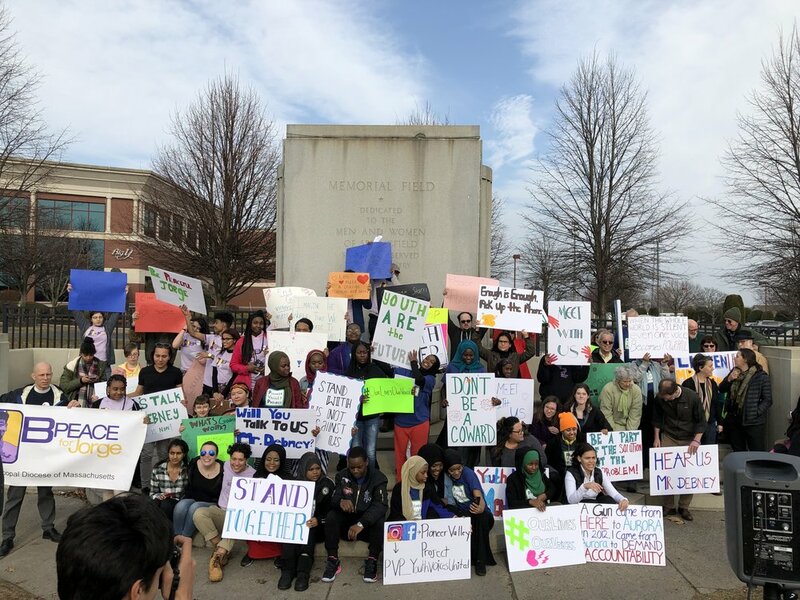 On Friday, March 15th, 2019, high school student leaders from B PEACE for Jorge and the Pioneer Valley Project Youth Voices United and adult allies gathered across the street from Smith & Wesson Gun Manufacturer. This marked one year since youth organizers from these two organizations began the call for Smith & Wesson’s CEO James Debney to be a part of the solution to address the epidemic of gun violence. After the school shooting on February 14, 2018 in Parkland, Florida, a mass movement arose across the country. There were student walkouts protesting gun violence, rallies at state capitols calling for gun reform, and more than 50 new laws passed in 25 states before the end of the year. Youth organizers from the B-PEACE for Jorge Campaign and the Pioneer Valley Project worked together from Boston to Springfield to organize an action in Massachusetts in which students walked, not to their state capitol, but to the global headquarters of Smith & Wesson in Springfield. Rather than meeting with legislators, young people used the action to ask for a meeting with Smith & Wesson’s CEO James Debney. Smith & Wesson (now officially known as American Outdoor Brands) is the company that manufactured the weapons used in this Parkland massacre as well as many other mass shootings, including the movie theater in Aurora, Colorado and the office park in San Bernadino, California. Student leaders also drew attention to the fact that gun violence not only includes mass shootings that get intense media attention but also the daily, often ignored, occurrence of gun homicides and injuries in urban areas around the country. They named the implicit racial disparity in national and local responses to various kinds of gun violence. Students asked for the meeting with CEO Debney to highlight the urgent need for gun manufacturers to take responsibility for the products they create, starting with Smith & Wesson. In a report published by American Outdoor Brands on February 8, 2019, Smith & Wesson’s holding company wrote to shareholders, “The Company’s reputation as a strong defender of the Second Amendment is not worth risking for a vague goal of improving the company’s reputation among non-customers or special interest groups with an anti-Second Amendment agenda.” The youth leaders and their adult supporters believe that if Smith & Wesson is going to produce guns, then the company needs to be a part of the solution to ending gun violence. “We’re not here to shut down Smith & Wesson. We’re here because gun violence is a real crisis in this country. We’re here because we want to sit down with CEO Debney and talk about how we can work together to end gun violence. We have some good ideas and we think he does too,” said Maana Daud, a 12th grader in Springfield and a leader with PVP Youth Voices United. Since the call began there has still been no word from CEO James Debney. Want to support youth leaders in working to find a collaborative approach to ending gun violence? You can call CEO James Debney at 800-331-0852 X6201. Call your representatives and ask them to call on CEO Debney to meet with youth leaders of B PEACE for Jorge and the Pioneer Valley Project. Email bpeace@ssypboston.org for more ways to get involved and stay tuned to this blog! Episcopal Diocese of eastern Massachusetts.